As much as I love California Pinot Noir, I’ve have been largely ambivalent to those from Carneros. Whenever I’ve tasted them in the past, they seemed pleasant enough but without the rich earthiness of Santa Barbara County examples or the brighter fruit you get from Russian River. The sole exception to this in my experience has been wines from Etude. I’ve had prior vintages of the Heirloom Pinot Noir before, and the 2007 version did not disappoint. The true revelation for me was the 2007 Deer Camp: just a hint brighter and more fruit-forward than its more famous brethren, its flavors on the palate were layered and its finish was long. For me, Deer Camp is neither better nor worse than the Heirloom, just different — though its price of $50 to $60 per bottle is unquestionably more attractive than that of Heirloom, which typically goes for $25-$30 more. The excellent Estate regular bottling lists on the winery’s website at $40, but can be found at a veritable bargain of high-$20’s, and at that price is easily comparable (and perhaps preferable) to similarly priced favorites from Russian River, Santa Ynez, or Santa Maria. For all the countless visits made to Napa over the years, I had never actually visited Stag’s Leap Wine Cellars until this trip, and even though I’ve had the good fortune to drink some of their famous Cabernets before, I relished the chance to try them all side by side. I was extra lucky that they were tasting the well-regarded 2007 vintage of their wines — except for their flagship “Cask 23” of which they had sold out of the ’07 and were tasting 2006’s instead. All of the Stag’s Leap cabs lived up their strong reputation, with each of their personalties coming through as expected: the entry-level 2007 “Artemis” was rock-solid and middle of the road (if you can call a $45 wine entry-level); the 2007 “Fay” subtle and subdued but still rich; the 2007 “S.L.V.” bold and sophisticated; the 2006 “Cask 23” layered and nuanced. They were all somewhere between excellent and outstanding. My favorite was the S.L.V. — easily matching the Gargiulo 575 OVX as the best 2007 cab I’ve had so far. Mrs. CKDH preferred the 2006 Cask 23 instead, making note of the very long finish. It was disappointing that we were unable to taste the 2007 Cask 23, and I wonder how the difference in vintage would have affected my preferences. 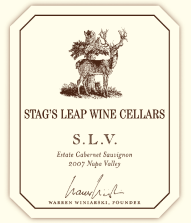 It’s worth noting that prices at Stag’s Leap were among the highest I’ve seen when comparing winery prices versus typical retail price. S.L.V. and Fay can typically be had for about $80 per bottle and the winery was asking $120 — a 50% mark up. 2006 Cask 23 was listed at $180 at the winery while a quick Google search shows numerous bottles available for around $150, with one source even asking just $139. I expect wineries to charge their full “list” price which will always be more than what you can find in the store, but these differences — in both absolute dollar and percentage terms — were a staggering rip off. If the difference was more modest (say, a still relatively steep $20), I would have been much more tempted to go home with a lighter wallet and some bottles in hand. As it turned out, we walked away without any wine. I’ve been collecting Robert Crag’s Bordeaux-style Cabernet Sauvignon blend since the 1994 vintage. I had a few bottles of the 1997 left and when a dear friend came into town, we decided to bring one of the bottles with us to dinner at Manhattan Beach Post. It has held up VERY nicely: after 15 minutes in a decanter, it opened up nicely with fruit and a hint of black pepper on the nose; lots of berry on the palate but structured and balanced, with tannins enough to allow the bottle to hold up for another few years. It has gained complexity without losing much flavor. This was exactly the kind of wonderful experience you hope for when you lay a bottle down for this long. It paired gloriously with David LeFevre’s yummy small plates. Tags: Cabernet Sauvignon, Etude wines, Gargiulo, Manhattan Beach Post, pinot noir, Robert Craig, Stag's Leap Wine Cellars. Bookmark the permalink.